← Thank You Emergency Responders/Monster Slayers of Franken-Disaster! Looking around at the aftermath of Hurricane Sandy, we can see changes everywhere. The landscape has changed on all scales for many of our eastern states after Hurricane Sandy made landfall on the New Jersey coast on October 29th. One of my close friends lives just outside Boston and she had trees knocked down and blown over in her yard. My cousin and his wife live in New Jersey and they have been contending with flooding in the city and trying to find gas. Others, and I’m sure you know people who have been affected, have woken up to entirely changed landscapes for their state’s shoreline. 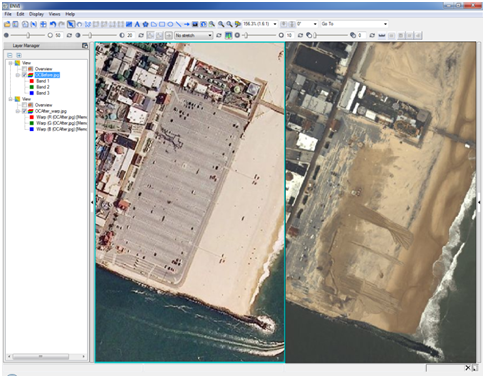 I found this excellent site by NOAA, showing before and after images of Hurricane Sandy’s destruction. Put your mouse cursor on each image and a small slider bar will appear. Swipe it from left to right to see the before and after imagery. The “Before” image was captured by Google and the “After” image was captured by NOAA’s National Geodetic Survey. If I bring some of these images into ENVI, you can see the changes side by side using the the multiple views. These images are of Ocean City, MD, where you can readily see the shoreline changes that have occurred here. The pier has been destroyed, shoreline erosion has increased due to the storm, and the parking lot has been inundated with water and sand. 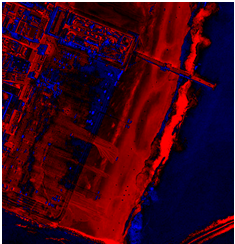 Using image analysis tools, we can see the different types of shoreline change that have happened, including looking at where destruction and removal of sand has occurred. 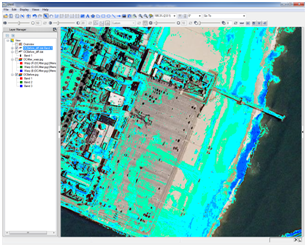 Here, looking at a change detection result, the red area shows regions that have had negative impacts (where sand has been removed, buildings removed, pier damaged, and where land has been flooded by water and wet sand). Most of the blue regions also show changes that have occurred, and usually here it is brighter sand deposition. And we can also map the locations of shoreline changes on top of the original imagery. It’ll take Ocean City a while to repair the damage that has occurred here, but I have no doubt that they’ll rebound, rebuild, and grow even stronger. We hope that everyone on the east coast that has been affected by the hurricane is doing well and staying safe. Please share your thoughts and images of how your community has been affected and how you believe they these communities will rebuild. Red Cross Disaster Relief and donation information can be found here. This entry was posted in Environmental Monitoring, Remote Sensing and tagged change detection, climate change, climate observation, coast line change, ENVI, environmental monitoring, Hurricane, hurricane sandy, image analysis, national geodetic survey, NOAA, ocean city md, remote sensing, Sandy, shoreline change. Bookmark the permalink.